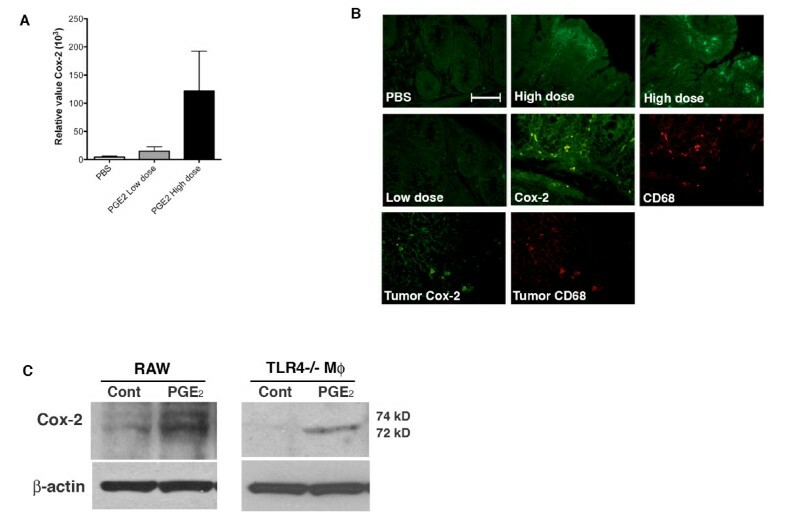 We have previously found that TLR4-deficient (TLR4-/-) mice demonstrate decreased expression of mucosal PGE 2 and are protected against colitis-associated neoplasia. However, it is still unclear whether PGE 2 is the central factor downstream of TLR4 signaling that promotes intestinal tumorigenesis. To further elucidate critical downstream pathways involving TLR4-mediated intestinal tumorigenesis, we examined the effects of exogenously administered PGE 2 in TLR4-/- mice to see if PGE 2 bypasses the protection from colitis-associated tumorigenesis. Mouse colitis-associated neoplasia was induced by azoxymethane (AOM) injection followed by two cycles of dextran sodium sulfate (DSS) treatment. Two different doses of PGE 2 (high dose group, 200 μg, n = 8; and low dose group, 100 μg, n = 6) were administered daily during recovery period of colitis by gavage feeding. Another group was given PGE 2 during DSS treatment (200 μg, n = 5). Inflammation and dysplasia were assessed histologically. Mucosal Cox-2 and amphiregulin (AR) expression, prostanoid synthesis, and EGFR activation were analyzed. In control mice treated with PBS, the average number of tumors was greater in WT mice (n = 13) than in TLR4-/- mice (n = 7). 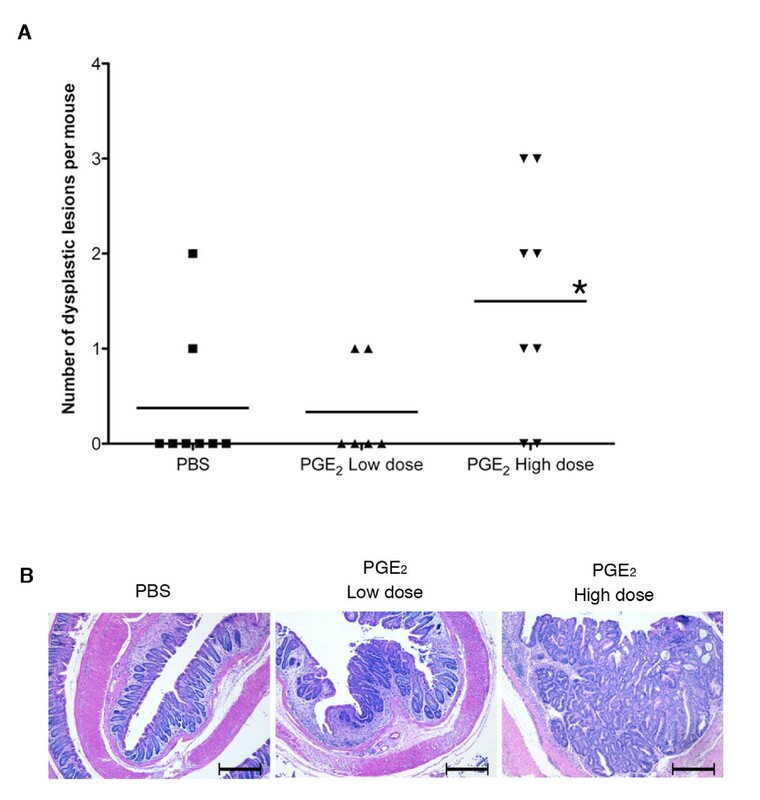 High dose but not low dose PGE 2 treatment caused an increase in epithelial proliferation. 28.6% of PBS-treated TLR4-/- mice developed dysplasia (tumors/animal: 0.4 ± 0.2). By contrast, 75.0% (tumors/animal: 1.5 ± 1.2, P < 0.05) of the high dose group and 33.3% (tumors/animal: 0.3 ± 0.5) of the low dose group developed dysplasia in TLR4-/- mice. Tumor size was also increased by high dose PGE 2 treatment. Endogenous prostanoid synthesis was differentially affected by PGE 2 treatment during acute and recovery phases of colitis. Exogenous administration of PGE 2 increased colitis-associated tumorigenesis but this only occurred during the recovery phase. Lastly, PGE 2 treatment increased mucosal expression of AR and Cox-2, thus inducing EGFR activation and forming a positive feedback mechanism to amplify mucosal Cox-2. These results highlight the importance of PGE 2 as a central downstream molecule involving TLR4-mediated intestinal tumorigenesis. Patients with ulcerative colitis (UC) are at increased risk of developing colorectal cancer. Epidemiological data has shown that the incidence and the onset of colorectal cancer in patients with UC is 4 to 10 times greater and 20 years earlier than that for the normal population [1, 2]. The colorectal cancer development in UC patients is specifically identified as colitis-associated cancer (CAC). The increased incidence of colorectal cancer in patients with UC highlights the well-known link between chronic inflammation and carcinogenesis . However, the precise mechanism linking inflammation and cancer is unknown. Therefore, understanding the mechanisms underlying inflammation-induced colorectal cancer will aid in establishing new strategies for prevention and/or treatment of CAC. Previous studies have shown that key mediators of intestinal inflammation in patients with UC are arachidonic acid metabolites, i.e. eicosanoids [4–6]. Among the eicosanoids, prostaglandin E 2 (PGE 2) is unique due to its multiple roles in controlling excessive inflammation and induction of mucosal cytoprotection [7–10]. A major action of PGE 2 in the intestinal mucosa is induction of epithelial proliferation in response to mucosal damage . On the other hand, PGE 2 has been implicated in the development of colorectal cancer which results from sustained over-expression of cyclooxygenase 2 (Cox-2) [12, 13]. Supporting the role of Cox-2 in intestinal cancer development, several epidemiological studies have demonstrated that long-term use of nonsteroidal anti-inflammatory drugs (NSAID), which are strong cyclooxygenase inhibitors, reduces the risk of developing colorectal cancer [14, 15]. 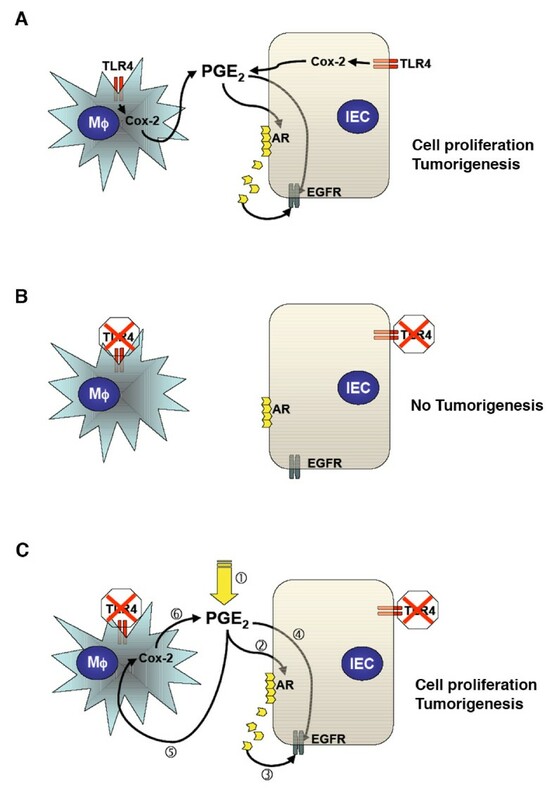 There are many possible pathways by which PGE 2 mediates colorectal carcinogenesis [16–18]. One of the main pathways involving PGE 2 mediated colorectal carcinogenesis is thought to involve epidermal growth factor receptor (EGFR) signaling . PGE 2 may induce EGFR phosphorylation through induction of EGFR ligands, or through intracellular mediators such as cAMP or PI 3 kinase . Increased EGFR tyrosine phosphorylation in the rectal mucosa of patients with UC has been reported . Since expression of both Cox-2 and PGE 2 is increased in the intestinal mucosa of patients with UC, as well as in CAC, Cox-2 induced PGE 2 may be a causal player in complex pathways linking chronic inflammation to the development of CAC [22–26]. We have previously shown that TLR4-mediated signaling is responsible for mucosal Cox-2 expression and PGE 2 synthesis in the setting of intestinal inflammation . We have also reported that this TLR4-Cox-2-PGE 2 axis is significantly involved in the development of intestinal neoplasms in a murine model of CAC . However, we do not know the identity of the critical downstream modulators of TLR4. For example, we have shown that Cox-2 expression is dependent on TLR4 and that, in the absence of TLR4, levels of PGE 2 are greatly reduced. But we do not know if PGE 2 production is necessary and sufficient to promote tumorigenesis in the absence of TLR4. In this study, we sought to better understand the role of PGE 2 in TLR4-mediated colitis-associated intestinal tumorigenesis. We have shown that TLR4 deficient mice are protected against the development of tumors in the CAC model . We first hypothesized that administration of PGE 2 would bypass the protection from development of intestinal tumors seen in TLR4-/- mice. TLR4-/- mice treated with high dose PGE 2 had increased size and number of tumors compared with control TLR4-/- mice. The incidence of neoplasia in PGE 2 treated TLR4-deficient mice was similar to that of WT mice without PGE 2 treatment. PGE 2 had an effect on the development of neoplasia when administered during the recovery phase of colitis but not during active colitis. Altered balance of cell-proliferative PGE 2 and other endogenous anti-inflammatory prostanoids was suspected as the mechanism for the distinct effects of PGE 2 during recovery and the acute phase of colitis. Mice treated with PGE 2 had increased expression of Cox-2 and the EGFR-ligand, AR, leading to increased phosphorylation and activation of EGFR, indicating positive feedback. In addition, epithelial cell proliferation in PGE 2-treated TLR4-/- mice was increased in a dose-dependent manner. Our results highlight the important role of PGE 2 in TLR4-mediated colorectal tumorigenesis in the setting of chronic inflammation. The TLR4-Cox-2-PGE 2 axis may be a potential target for the establishment of more effective treatment and prevention of CAC. TLR4-/- mice were purchased from Oriental Bio Service, Inc. (Kyoto, Japan), and backcrossed to C57Bl/6J mice (Jackson Laboratory, Bar Harbor, Maine) over 8 generations. Mice were kept in specific-pathogen free (SPF) conditions and fed by free access to a standard diet and water. All experiments were done according to Mount Sinai School of Medicine and University of Miami Miller School of Medicine animal experimental ethics committee guidelines and the experimental protocol has been approved by Institutional Animal Care and Use Committee (IACUC). Mouse colitis-associated neoplasia was induced as previously described [28, 29]. Briefly, six to ten week old gender-matched mice were injected with 7.4 mg/kg of AOM (Sigma-Aldrich, St. Louis, MO) intraperitoneally (i.p.) at the beginning of the experiment (day 0). Two weeks after AOM injection, mice were given two cycles of DSS treatment (Figure 1). For each cycle, 2.5% DSS (MW 36-50 kDa: ICN, Aurora, Ohio) was given in their drinking water for 7 days followed by 14 days of recovery in which they received normal water. PGE 2 (Cayman Chemical, Ann Arbor, MI) was diluted in ethanol (10 mg/ml) then further diluted in PBS. Two different doses of PGE 2 (high dose group, 200 μg/150 μl/mouse, n = 8 and low dose group, 100 μg/150 μl/mouse, n = 6) were administered daily by gavage feeding during each recovery period. Another group of mice received high dose PGE 2 (200 μg/150 μl/mouse, n = 5) during DSS treatment (Figure 1). The PGE 2 doses were determined by our previous study . WT mice were treated with only AOM and DSS. Body weights, stool consistency, and stool occult blood were monitored to analyze disease activity index (DAI) during DSS treatment and recovery phase, as described previously [28, 30]. Control mice were given PBS with ethanol. Experimental protocol. PGE 2 was administered in two different doses (high dose group 200 μg/mouse, and low dose group 100 μg/mouse) and phases (recovery period and during DSS treatment). Control mice were given the same volume of PBS. AOM and DSS (2.5%) were administered as shown. Mice were sacrificed on day 56. Mice were sacrificed on day 56. Colons were removed, opened longitudinally, prepared using the Swiss roll method, fixed in 10% buffered formalin, and embedded in paraffin . Every 30 sections (5 μm) of serial cuts were stained with hematoxylin and eosin. Histological assessment was performed by a gastrointestinal pathologist (R.X) who was blind as to the mouse genotype and treatment. Severity of mucosal inflammation was graded using a standard scoring system [28, 30]. Dysplastic lesions were determined by previously established criteria . The number, size, and percentage of the mucosal surface area containing dysplasia were determined under the microscope. The size of the lesions was calculated using a scale micrometer on the microscope. Colonic tissue sections were examined for cell proliferation by bromodeoxyuridine (BrdU) labeling as described previously . Mice were intraperitoneally injected with 120 mg/kg of BrdU (Sigma-Aldrich, St. Louis, MO) 90 minutes prior to sacrificing and colonic tissues were stained using a BrdU staining kit (Zymed Laboratories Inc, San Francisco, CA). The number of BrdU-positive cells per well-oriented crypt were calculated in every 10 crypts for each colon segment at high magnification under light microscopy. Apoptotic cells in colonic epithelial cells were detected using the terminal deoxynucleotidyl transferase (TdT)-mediated free 3'-OH end labeling (TUNEL) assay (ApopTaq In Situ Apoptosis Detection Kit; Chemicon, Temecula, CA), following the manufacturer's instructions. Sections were counterstained with 4',6-diamidino-2-phenylindole (DAPI). The apoptotic cells were counted as we described previously and the ratio of TUNEL positive nuclei to 100 total nuclei in the epithelial cells counted was calculated . Mouse macrophage cell line RAW264.7 cells (1 × 10 6 cells/well) (ATCC, Manassas, VA) were maintained in Dulbecco's modified Eagle's medium supplemented with 1% heat-inactivated FBS, 2 mM L-glutamine, 1% penicillin/streptomycin and were incubated in 6-well plates overnight at 37°C in a 5% CO 2 humidified incubator. Cells were incubated with 10 μM PGE 2 (Cayman Chemical, Ann Arbor, MI) for 18 hours. One μg of total RNA was isolated from non-tumor colonic tissues using RNA Bee (Tel-Test, Inc., Friendwood, TX) and used as the template for single strand cDNA synthesis utilizing the Transcriptor First Strand cDNA Synthesis Kit (Roche, Indianapolis, IN) according to the manufacturer's instructions. Quantitative real-time PCR was performed for AR, Cox-2, MIP-2, and β-actin. The primers and probes used in this study are as follows; for mouse amphiregulin: sense primer, TGT CAC TAT CTT TGT CTC TGC CAT, anti-sense primer, AGC CTC CTT CTT TCT TCT GTT TCT; for mouse Cox-2: sense primer, AAG GAA CTC AGC ACT GCA TCC, anti-sense primer, ACA GGG ATT GGA ACA GCA AGG A; for mouse MIP-2: sense primer, ATC CAG AGC TTG AGT GTG ACG C, anti-sense primer, AAG GCA AAC TTT TTG ACC GCC; for mouse β-actin: sense primer, ATG ACC CAG ATC ATG TTT G, anti-sense primer, TAC GAC CAG AGG CAT ACA. All primers were designed using Beacon Designer 3.0 (Premier Biosoft International, Palo Alto, CA). The cDNA was amplified using SYBR Premix Ex Taq™ (Takara Bio Inc., Shiga, Japan) with 7900 HT sequence detection system (Applied Biosystems, Foster City, CA). The amplification results were analyzed using SDS 2.2.1 software (Applied Biosystems, Foster City, CA) and the gene of interest was normalized to the corresponding β-actin results. Data were expressed as fold induction relative to the lowest gene product amplified. Whole cell lysates were prepared from RAW264.7 cells, peritoneal macrophages or colonic tissue samples using a lysis buffer, M-PER Mammalian Protein Extraction Reagent (Thermo, Waltham, MA), and a proteinase inhibitor cocktail (Calbiochem, San Diego, CA). The peritoneal macrophages were taken from TLR4-/- mice by peritoneal lavage using sterile PBS. Protein concentration was determined by the Bradford method using Bio-Rad Protein Assay with SmartSpec™ 3000 (Bio-Rad Laboratories, Hercules, CA) and Biotek μQuant (Winooski, VM). Lysates (10 to 30 μg) were subjected to 10% NuPAGE and transferred to Immobilon-P PVDF membranes (Millipore Corporation, Bedford, MA). The membrane was blocked in 5% non-fat dry milk and was immunoblotted with primary antibodies, followed by HRP-conjugated corresponding secondary antibodies. The membrane was exposed on an x-ray film using an enhanced chemiluminescent substrate SuperSignal West Dura Kit (Pierce Biotechnology, Rockford, IL). Antibodies against phospho-EGFR (Tyr 1068, mAb) and EGFR (rabbit polyclonal) were purchased from Cell Signaling (Beverly, MA) and Millipore Corporation (Bedford, MA), respectively. Anti-murine Cox-2 antibody (rabbit polyclonal) was purchased from Cayman Chemical (Ann Arbor, MI). Corresponding secondary antibodies, anti-goat and anti-rabbit -HRP were purchased from Jackson ImmunoResearch Laboratories, Inc (West Grove, PA). ß-actin (both human and mouse anti- ß-actin from Sigma-Aldrich, St. Louis, MO) was used as an internal control for protein loading. Amphiregulin concentration from colonic tissue lysates (not including the polypoid lesions) was measured by ELISA (R & D Systems, Minneapolis, MN). ELISA was performed per the manufacturer's instructions, and the results were normalized with protein concentration to demonstrate picograms of AR per mg of protein. Formalin-fixed paraffin-embedded sections were incubated in 10% normal goat serum for 1 hr and stained with anti-murine Cox-2 antibody (1:200, Cayman, Ann Arbor, MI) overnight at 4°C, followed by FITC-conjugated anti-rabbit IgG (1:200, Zymed Laboratories, South San Francisco, CA) for 1 h at room temperature. The specificity of staining was confirmed using a rabbit isotype control antibody instead of the primary antibody (Zymed Laboratories, South San Francisco, CA) as we described previously . For double immunofluorescent staining of CD68 and Cox-2, sections were first incubated with 0.1% Trypsin (Sigma, St. Louis, MO) CaCl 2 dissolved in 0.05 M Tris-Hcl pH 7.6 for 15 min at 37°C. Subsequently, sections were blocked in a 5% non-fat dry milk for 1 h and then incubated with the rat anti-CD68 antibody (1:100, MCA1957S, Serotec Ltd., Raleigh, NC) overnight at 4°C. After washing in PBS, sections were incubated with TRITC-conjugated rabbit anti-rat IgG (1:200, Sigma, St. Louis, MO) for 1 h at room temperature. Sections were then re-incubated with 5% non-fat dry milk followed by Cox-2 staining as described above using FITC-conjugated goat anti-rabbit IgG (1:200, Sigma, St. Louis, MO). Production of Prostaglandins PGE 2 and 15d-PGJ2 (15-deoxy-delta12,14-prostaglandin-J2) in the tissue culture supernatant was determined using EIA kit (Cayman, Ann Arbor, MI) according to the manufacturer's instructions. 100 mg colonic tissue fragments were washed in cold PBS containing penicillin, streptomycin, and fungizone (100 U/ml each). Samples were cultured for 24 hours in 12 well flat bottom plates in serum free RPMI 1640 with penstrep. Data were presented as mean (± SD). Graphical analyses, statistical analysis, and nonlinear regression analysis of the data were performed using Prism 2.0c (GraphPad Software, San Diego, Calif.). Unpaired Student's t test was used to determine statistical significance for two independent samples. Comparison of more than three subjects was performed by nonparametric ANOVA (Kruskal-Wallis) followed by Mann-Whitney U test. P values were considered significant when < 0.05. We have demonstrated that TLR4-/- mice are protected against development of colitis-associated neoplasia in the AOM-DSS model . Since TLR4-/- mice are characterized by decreased expression of mucosal Cox-2 and PGE 2, we hypothesized that exogenous administration of PGE 2 would bypass the protection against colitis-associated tumorigenesis in TLR4-/- mice [27, 28]. We tried two different doses of PGE 2 (high dose; 200 μg/day, and low dose; 100 μg/day) treatment during the recovery period. The doses of PGE 2 were determined based on our previous study, which showed that 200 μg of PGE 2 was enough to induce intestinal epithelial cell proliferation in TLR4-deficient mice . First, we examined the incidence of dysplasia at day 56. High dose but not low dose PGE 2 treatment resulted in an increase in dysplasia incidence in TLR4-/- mice. Compared to 28.6% of PBS-treated TLR4-/- mice (n = 7) that develop dysplasia, 75% of the high dose group and 33.3% of the low dose group developed dysplastic lesions. In comparison, the incidence of dysplasia in WT mice was 92.3% (n = 13). When the number of dysplastic lesions per mouse was examined, a significant increase of dysplastic lesions was observed in the high dose group (Figure 2A). However, this increase in the number of dysplastic lesions was not found in the low dose group. Administration of PGE 2 promotes development of colitis-associated neoplasia in TLR4-/- mice. A. Incidence of dysplasia. The number of dysplastic lesions was counted per mouse under the microscope. Data are expressed as mean (± SD) (*P < 0.05). B. Microscopic pictures of H & E staining in colon sections (Original magnification ×100, Bars indicate 200 μm). Next we examined whether PGE 2 treatment influenced the size of the dysplastic lesion. PGE 2 treatment increased the size of the dysplastic lesions (Figure 2B)(Table 1). The average size of the lesions in the high dose group was significantly greater than that in the PBS treated controls (P < 0.05). These dysplastic lesions; however, were still smaller than the lesions in WT mice. Every lesion in the low dose group was bigger than any lesion found in PBS treated controls, but the difference did not yield statistical significance (P = 0.37). These results suggest that TLR4-mediated up-regulation of mucosal PGE 2 during the recovery phases of colitis may be responsible for the development and growth of colitis-associated neoplasia. * P < 0.05, compared to corresponding result in PBS treated control mice. We have previously shown that PGE 2 supplementation restores the defective mucosal repair of TLR4-/- mice during acute DSS treatment . When we compared mucosal PGE 2 production between the acute phase (after 7 days of DSS treatment) and the chronic phase (day 56) of colitic WT mice, the mice in the acute phase of colitis had significantly higher production of mucosal PGE 2 than the mice in the chronic inflammatory phase (331.0 ± 202.2 vs., 223.8 ± 132.8 pg/mg, P < 0.05). Therefore, increased mucosal PGE 2 production might have different roles during the acute and the chronic phases of colitis. We thus examined whether exogenous administration of PGE 2 during DSS treatment (acute phase of colitis) also increased the incidence of colitis-associated neoplasia. Twenty percent of the mice treated with PGE 2 (n = 5, 200 μg/day) during DSS treatment developed dysplasia, while 28.6% of PBS treated control mice (n = 7) had dysplasia. The average number of dysplastic lesions per mouse was 0.6 ± 1.3 (0 - 3) and was not statistically different from the number in PBS treated mice (0.5 ± 0.8; 0 - 2). The size of the lesions was also similar between PGE 2 treated mice (0.6 ± 0.8 mm) and PBS treated controls (0.5 ± 0.8 mm). These results suggest that increased mucosal PGE 2 during the acute phase of colitis does not promote tumorigenesis. To address why PGE 2 did not act tumorigenic when given during the acute phase of colitis, we first graded the severity of the colitis. We have shown that PGE 2 ameliorates acute colitis in TLR4-/- mice if administered during DSS treatment , but we do not know the effect of PGE 2 on chronic intestinal inflammation when given during the recovery period of colitis. It is possible that PGE 2 treatment during the recovery period of colitis may differentially affect intestinal inflammation and thus development of colitis-associated neoplasms. When we reviewed the disease activity index (DAI), all PGE 2 treated mice showed sustained increase of disease activity during recovery phase of colitis mainly due to sustained diarrhea and poor BW recovery (Figure 3A). This trend was observed even in the mice that received PGE 2 during DSS, although they had lower DAI during the acute phase (Figure 3A). In addition, there were no significant differences in severity of colitis on day 56 between the mice that received PGE 2 treatment of different doses and at different times (P = 0.1391) (Figure 3B). Among each category of histological scoring (Crypt damage, Neutrophil infiltration, Edema, Ulcerations, Mononuclear cell infiltration, Epithelial regeneration, and distortion), no particular difference was observed. Thus, temporal amelioration of colitis during DSS treatment by PGE 2 did not result in reduction of chronic colitis. PGE 2 administration did not alter severity of chronic colitis. A. Cumulative disease activity index (DAI) score defined as body weight change, hemocult blood, and stool consistency. Score was measured three times per week. B. Histological score of colitis. There are no statistical differences in severity of colitis between the mice that received different PGE 2 treatment doses and timing (n = 13 WT; n = 7 PBS group; n = 8 high dose PGE 2 200 μg group; and n = 6 low dose PGE 2 100 μg group; n = 5 PGE 2 200 μg during DSS treatment; NS: no significance). C. Mucosal 15d-PGJ2 (left panel) and endogenous PGE 2 (right panel) synthesis during acute colitis. Mice received AOM and after 14 days, DSS was given for 7 days. PGE 2 treatment (200 μg/day) significantly up-regulates mucosal 15d-PGJ2 synthesis but not endogenous PGE 2 in TLR4-/- mice at day 7 of DSS colitis (n = 5 each). WT mice received only AOM and DSS. Data are expressed as mean (± SD) (*P < 0.05). D. 15d-PGJ2 (left panel) and endogenous PGE 2 (right panel) synthesis at 14 day recovery from DSS colitis. Mice were examined at the end of the first cycle of AOM-DSS treatment. There is no difference of 15d-PGJ2 synthesis between TLR4-/- mice that received PGE 2 (200 μg/day) during DSS colitis and during the recovery from DSS colitis (n = 5 each, P = 0.441). By contrast, significant increase of endogenous PGE 2 is shown in the mice that received PGE 2 during the recovery phase. This increase of endogenous PGE 2 is not seen in the mice that received PGE 2 during DSS treatment (acute phase). Data are expressed as mean (± SD). To further clarify the underlying mechanism for the distinct effect of PGE 2 between the acute and recovery phases of colitis, we measured mucosal 15d-PGJ2 (15-deoxy-delta12,14-prostaglandin-J2) synthesis in acute (day 7 of DSS treatment) and recovery (14 days after 7 days DSS treatment) phases of colitis and compared the effect of PGE 2 treatment on 15d-PGJ2 synthesis at the different treatment times (Figure 3B, C). 15d-PGJ2 is known as an anti-inflammatory prostaglandin which is also induced by Cox-2 . 15d-PGJ2 plays a role in the prevention and/or resolution of inflammation mainly through peroxisome proliferator-activated receptor gamma activation . 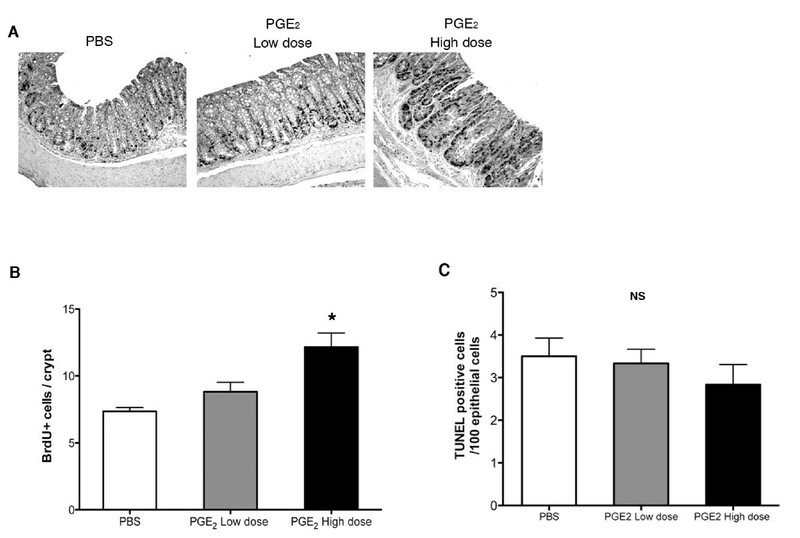 In the acute phase, mucosal 15d-PGJ2 synthesis in PGE 2 treated TLR4-/- mice was significantly up-regulated and corresponded to the amelioration of colitis by PGE 2 treatment (Figure 3C left). The level of mucosal 15d-PGJ2 was similar to 15d-PGJ2 synthesis in DSS-treated WT mice (day 7, without PGE 2 treatment). 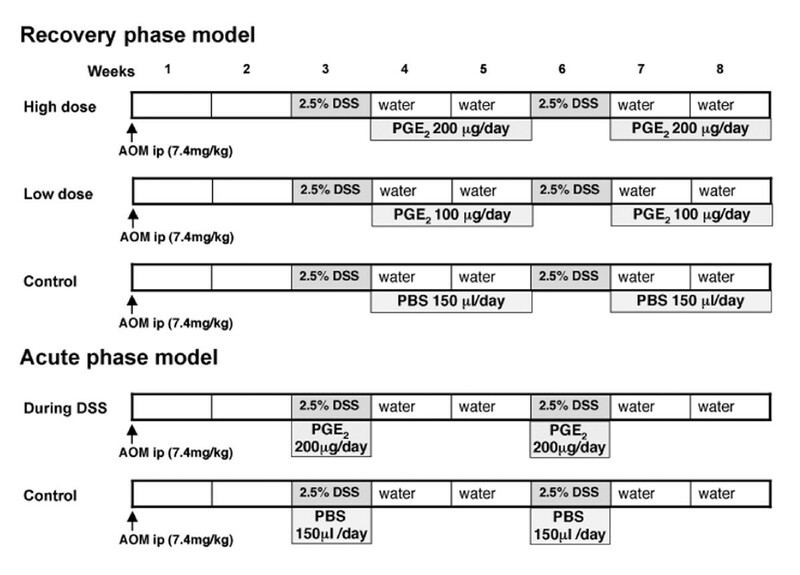 In contrast, endogenous mucosal PGE 2 synthesis was similar between PBS treated and PGE 2 treated mice (Figure 3C right). The up-regulation of 15d-PGJ2 synthesis was not seen when PGE 2 was given during the recovery period of colitis (Figure 3D left). 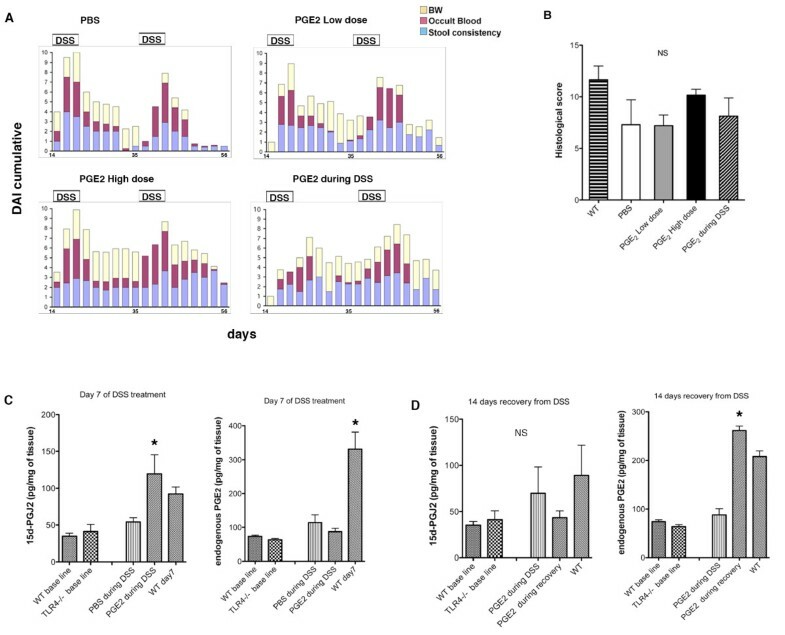 In addition, the level of up-regulated mucosal 15d-PGJ2 in the mice treated with PGE 2 during DSS administration went down after the two week recovery period (Figure 3D left). Although we do not see a difference in mucosal 15d-PGJ2 synthesis, endogenous mucosal PGE 2 is significantly increased in the mice treated with PGE 2 during recovery compared to the mice treated with PGE 2 during acute colitis (Figure 3D right, P < 0.001). These results indicate that there is a stimuli that induces 15d-PGJ2 during active colitis but not during recovery from colitis and that the ratio of PGE 2 vs. 15d-PGJ2 (cell-proliferative vs anti-inflammatory prostaglandins) is balanced only in the active phase of colitis. Without such stimuli to induce 15d-PGJ2 production, intestinal mucosa cannot maintain the balance between PGE 2 and 15d-PGJ2 during the recovery phase. In contrast, PGE 2 administration during recovery from colitis enhances endogenous PGE 2. Exogenously administered PGE 2 disturbs the balance between cell-proliferative (PGE 2) and anti-inflammatory (15d-PGJ2) prostanoids during the recovery phase but not during the acute phase of colitis. Increased epithelial cell proliferation has been associated with colorectal tumorigenesis . We have demonstrated that TLR4-/- mice have significantly reduced epithelial cell proliferation following DSS injury compared to WT mice. Therefore, we examined whether PGE 2-induced tumor development in TLR4-/- mice was accompanied by increased epithelial proliferation. Proliferative cells were labeled with BrdU and the number of BrdU positive epithelial cells was counted (Figure 4A). Compared to PBS treated control mice, the mice treated with high dose PGE 2 had a significantly increased number of BrdU positive epithelial cells per crypt (Figure 4B). Corresponding to the incidence of dysplasia, mice in the low dose group did not show a significant increase in epithelial cell proliferation compared to PBS treated controls. We then confirmed if the balance of epithelial proliferation and apoptosis was disturbed in the intestine of those mice by using TUNEL assay (Figure 4C). There were no differences in epithelial apoptotic cell number in those mice. These results indicate that increased epithelial proliferation induced by high dose PGE 2 treatment was not accompanied by increased apoptosis. Therefore there may be a threshold effect of PGE 2 to induce epithelial cell proliferation. High dose PGE 2 administration drives epithelial cell proliferation in the setting of chronic colitis. A. Immunohistochemical staining of incorporated BrdU. Cells under S-phase (proliferative) are labeled with BrdU as brown nuclei. Original magnification 200 ×, Bars indicate 100 μm. B Proliferative index (Number of BrdU positive cells per crypt) was counted in intestinal epithelial cells. BrdU positive cells were counted in 10 crypts of each colon segment per high power field (HPF) (30 crypts/mouse). The high dose group (n = 8) has significantly greater number of BrdU positive cells per crypt than PBS treated controls (n = 7). Data are expressed as mean (± SD) (*P < 0.05). PGE 2 has been reported to induce AR expression, which is involved in the growth of colon cancer cells through epidermal growth factor receptor (EGFR) signaling . We have shown the importance of AR in TLR4-mediated colitis-associated tumorigenesis . Having demonstrated that PGE 2 administration bypasses the phenotype of TLR4-/- mice, we predicted PGE 2 treatment might increase mucosal AR expression. Real time PCR demonstrated that mucosal AR expression was significantly higher in both high dose and low dose groups compared to PBS treated controls (Figure 5A). AR protein levels in colon lysate measured by ELISA are consistent with the mRNA levels (Figure 5A). This result led us ask whether increased mucosal expression of AR activates EGFR, a potential mechanism for increased epithelial proliferation. We examined mucosal EGFR activation (non-tumor area) by Western blotting and found that mice in high dose and low dose groups had increased mucosal EGFR phosphorylation (Figure 5B). These data support a link between PGE 2 and EGFR signaling in the colonic epithelium through induction of EGFR ligands. High dose PGE 2 may promote a positive feedback loop in EGFR signal-mediated cell proliferation by inducing Cox-2 expression. A. Mucosal expression of AR in TLR4-/- mice treated with PGE 2; day 56 in AOM-DSS model (Left graph: mRNA analyzed by real-time PCR, Right graph: protein measured by ELISA). Data are represented as mean (± SD) of relative values of expression (n = 7 PBS group, n = 8 high dose and n = 6 low dose groups, *P < 0.05). B. Western blot analysis of phosphorylated EGFR and EGFR in the colon. Results from three representative samples obtained from TLR4-/- mice under each treatment in AOM-DSS model. An equal amount of protein (25 μg/lane) was loaded per lane. The membrane was sequentially probed for phospho-EGFR and EGFR. We next addressed whether PGE 2 administration influenced mucosal Cox-2 expression. PGE 2 has been shown to increase Cox-2 expression in colon cancer cells resulting in a positive feedback loop that contributes to deregulated cell proliferation via EGFR activation [36–38]. In our model, the high dose group but not the low dose group showed increased mucosal Cox-2 expression compared to the PBS treated controls (Figure 6A). Real time PCR demonstrated no differences of mucosal MIP-2 mRNA expression among these groups (PBS: 75.1 ± 85.4, Low dose PGE 2: 79.3 ± 64.1, High dose PGE 2: 84.6 ± 56.3, P = 0.978). The discrepancy between the expression patterns of Cox-2 and MIP-2 suggests that the enhanced Cox-2 expression observed in the mice that received high dose PGE 2 was not likely part of a general inflammatory change. Next we examined which cell type within the mucosa is responsible for the increased Cox-2 expression induced by PGE 2 treatment. Immunofluorescent detection of Cox-2 demonstrated that the main source of mucosal Cox-2 was lamina propria cells after PGE 2 treatment (Figure 6B). TLR4-/- mice treated with PBS had very few Cox-2 positive cells in the mucosa. Consistent with our previous data , those lamina propria cells were mainly CD68 positive macrophages (Figure 6B). The Cox-2 positivity was similar between the tumor and its surrounding mucosa (Figure 6B). PGE 2 -mediated up-regulation of Cox-2 expression. A. Real-time PCR results for mucosal Cox-2 mRNA expression in TLR4-/- mice treated with PGE 2; day 56 in AOM-DSS model. Data are represented as mean (± SD) of relative values of expression (n = 7 PBS group; n = 8 high dose group, PGE 2 200 μg; and n = 6 low dose group, PGE 2 100 μg; n = 5 PGE 2 during DSS treatment, PGE 2 200 μg; *P < 0.05). B. Immunofluorescent staining for Cox-2 in the colon. Representative pictures show Cox-2 positive cells (green - FITC) in lamina propria cells. High dose PGE 2 treated mice show many Cox-2 positive cells in the lamina propria. Low dose PGE 2 treated mice and PBS treated mice have very few Cox-2 positive cells in lamina propria. Double staining demonstrates most Cox-2 positive cells (green - FITC) are also positive for CD68 (red - TRITC) both in the non-tumor area (middle panel) and tumor area (bottom) (serial pictures in same area are shown). Original magnification: 400 ×. Bars indicate 50 μm. C. Western blot analysis of Cox-2 production in murine macrophage cell line RAW246.7 and TLR4-/- peritoneal macrophages. Representative results from three independent experiments. Cells were treated with 10 μM PGE 2 for 18 hours. An equal amount of protein was loaded per lane. The membrane was sequentially probed for Cox-2 and β-actin. Next we tried to confirm if PGE 2 enhances Cox-2 expression in murine macrophage cell line RAW246.7. Western blot analysis showed that PGE 2 enhanced the expression of Cox-2 (Figure 6C). Peritoneal macrophages isolated from TLR4-/- mice also demonstrated the induction of Cox-2 in response to PGE 2 (Figure 6C). Thus, enhanced Cox-2 expression from subepithelial macrophages is a key player within the positive feedback loop with PGE 2 over-synthesis and epithelial EGFR activation in the induction of aberrant epithelial cell proliferation in the process of colitis-associated tumorigenesis. Our results indicate that PGE 2 can act upstream of Cox-2 to amplify mucosal Cox-2 production via macrophages and thereby enhances IEC proliferation especially during the recovery phase of colitis. PGE 2 has been implicated in the pathogenesis of IBD [39–41] as well as in colorectal cancer [42, 43]. Accumulating evidence demonstrates elevated tissue PGE 2 levels in human colorectal tumors compared to normal mucosa, suggesting a significant role of PGE 2 in colorectal tumorigenesis [43–45]. Since chronic inflammation may induce PGE 2 secretion by increasing Cox-2 expression, PGE 2 may be a link between inflammation and carcinogenesis. We have described that TLR4 deficiency leads to defective mucosal production of PGE 2, Cox-2 and AR expression. TLR4-/- mice are protected against development of colitis-associated neoplasia. But in vivo, we can not determine which is the critical mediator of tumorigenesis, since all of these molecules have been independently implicated in the development of colorectal neoplasms. Thus we questioned the role of PGE 2 in TLR4-mediated colorectal tumorigenesis. The current study demonstrates that oral PGE 2 supplementation during the recovery period of colitis promotes development of colitis-associated neoplasia in TLR4-/- mice. Interestingly, the timing of PGE 2 administration is critical: PGE 2 given during the acute inflammatory phase does not increase susceptibility to neoplasia whereas during the recovery phase it does. These data suggest a threshold effect for PGE 2 and that PGE 2 in a recovery milieu crosses the threshold to neoplasia. In the absence of TLR4, PGE 2 is necessary and sufficient to induce mucosal AR expression and EGFR phosphorylation even in low doses. The fact that low dose PGE 2 induces similar amounts of AR and EGFR phosphorylation as high dose PGE 2 but does not have the same degree of proliferation or tumorigenesis, suggests that high dose PGE 2 has alternate effects that promote tumor formation. For example, high dose PGE 2 induces Cox-2, which may activate additional genes. It is true that activation of EGFR and up-regulation of AR is not only involved in intestinal tumorigenesis but is also involved in the normal mucosal repair process. Therefore, the discrepancy in our results between AR-induced EGFR activation in cellular proliferation and in tumor development suggests the different roles of this process. While there may be more factors involved in the regulation of the different roles of AR-induced EGFR activation during colitis and colitis-associated tumorigenesis, our results demonstrate an important mechanistic insight into TLR4-mediated colitis-associated tumorigenesis. The source of the increased Cox-2 in the mucosa is subepithelial macrophages. Therefore, we conclude that excess PGE 2 may increase mucosal Cox-2 expression from subepithelial macrophages in the recovery period of colitis, forming a positive feedback loop that induces aberrant epithelial cell proliferation resulting in the development and growth of colitis-associated neoplasms (Figure 7). Role of PGE2 in bridging TLR4 signaling and intestinal tumorigenesis. A. In WT intestine, TLR4 expression is increased in chronic inflammation and PGE 2 synthesis is induced by Cox-2 induction. Produced PGE 2 stimulates the expression and release of AR and then EGFR activation either directly or through AR release. Sustained activation of this pathway results in aberrant cell proliferation and tumorigenesis. B. In the absence of TLR4, chronic intestinal inflammation does not induce tumorigenesis. C. When PGE 2 is exogenously administered to TLR4-/- mice ①, PGE 2 activates EGFR either directly ④ or through AR ②③. This may be not enough to induce tumorigenesis. However, exogenous PGE 2 induces Cox-2 production in macrophages ⑤ that causes the release of endogenous PGE 2, forming a positive feedback loop, which induces tumorigenesis ⑥. There are conflicting reports on the effect of exogenous PGE 2 in mouse models of colorectal tumors. Exogenous PGE 2 administration has been reported to increase the number of polyps in APC-Min/+ mice [16, 46]. Another report demonstrated PGE 2 treatment reduced the number and size of polyps in APC-Min/+ mice even though they showed increased epithelial proliferation . In another model of colorectal tumors induced by AOM, PGE 2 treatment increased the number and size of colorectal tumors . What is unique about our work is that we used TLR4-/- mice to ask whether replacing PGE 2 increased their susceptibility to neoplasia. Our results demonstrate that PGE 2 treatment during the recovery period of colitis promotes epithelial proliferation and increases the number and size of colitis-associated neoplasms in TLR4-/- mice. We have not seen these effects of PGE 2 in WT mice (data not shown). Treatment of WT mice with exogenous PGE 2 during acute colitis had no effect on epithelial proliferation . These results indicate that there are distinct roles of PGE 2 in intestinal mucosal homeostasis and tumorigenesis. The dose of PGE 2 also changes the role of PGE 2; low dose PGE 2 treatment did not induce epithelial proliferation or increase colorectal neoplasms. When we used 16,16-dimethyl-PGE 2 either by i.p injection or gavage feeding (200 or 100 μg/150 μl/mouse, daily), all TLR4-/- mice succumbed during the active colitis period due to aggravated colitis (data not shown). Although PGE 2 has been implicated in intestinal cytoprotection against acute mucosal damage, overproduction or prolonged production of PGE 2 may worsen colitis or induce tumorigenesis, respectively [49–52]. Our results suggested that the balance of mucosal PGE 2 level to 15d-PGJ2 is important in determining the PGE 2-mediated effect in the intestine. This idea is further supported by the fact that different prostaglandin EP receptor subtypes cause different effects in the intestinal mucosa, and individual EP receptor subtypes are activated by different concentrations of PGE 2 [53–57]. Another aspect that merits explanation is whether different EP receptor subtypes are induced during different phases of inflammation. TLR4-/- mice have defective mucosal PGE 2 synthesis and are more susceptible to DSS-induced colitis [27, 58]. Therefore, TLR4-mediated PGE 2 production is necessary for restitution during acute inflammation but its continued production is detrimental. This finding provides an important insight into targeting PGE 2 during specific phases of IBD. We have described AR and EGFR as downstream mechanisms used by PGE 2 to enhance tumorigenesis. In addition, PGE 2 induced mucosal Cox-2 expression mainly in subepithelial macrophages, has been implicated in TLR-mediated induction of epithelial cell regeneration and proliferation through Cox-2 expression [59, 60]. Induction of cAMP is the key pathway involved in PGE 2-mediated enhancement of Cox-2 expression in macrophages [36, 61]. Because TLR4 potentially induces Cox-2, this may explain why mucosal PGE 2 is not down-regulated during the recovery period when active inflammation is gone. The positive feedback loop involving Cox-2, PGE 2, AR expression, and EGFR activation is therefore crucial in TLR4-mediated colitis-associated tumorigenesis. Selective Cox-2 inhibitors are available for clinical use and are effective in reducing the risk of intestinal adenomatous polyps, although routine use for cancer chemoprevention remains problematic because of the increased cardiovascular complications with long-term use [62, 63]. Studies in patients with UC in remission demonstrated that celecoxib, a selective Cox-2 inhibitor, did not cause the disease to flare . Based on our current study, we suggest that targeting TLR4 or PGE 2 overproduction during the quiescent phase of colitis may have a potent beneficial effect on the prevention of CAC. The study was supported by NIH grants AI052266 (MTA), DK069594 (MTA), Career Development Award from CCFA (MF). YH & MF wrote the paper. MTA & MF designed research. YH, JS, KB, DC, AC, DH, RU, LH, CP & MF performed research. YH, RX & MF analyzed data. The manuscript has been seen and approved by all authors.